Viktor Mikhaylovich Vasnetsov – one of the most famous Russian artists, his brother Apollinaris also known, but rather those interested in historical painting and theatre. 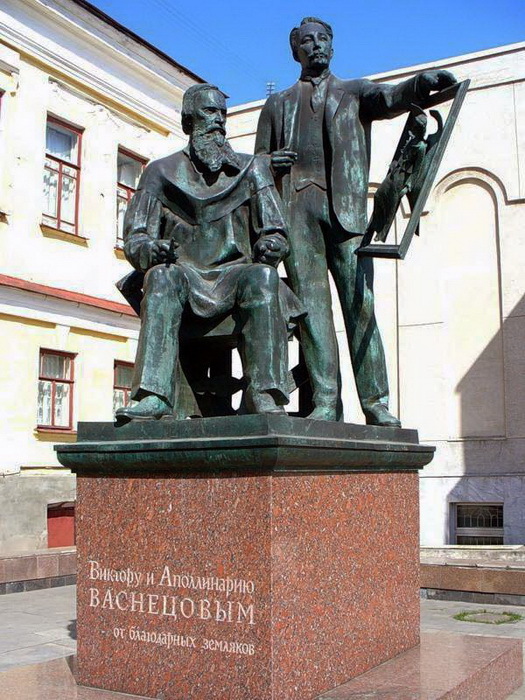 Other brothers Vasnetsovy, in particular, Arkady, are in the shadow of the fame of the great painter-сказочника. 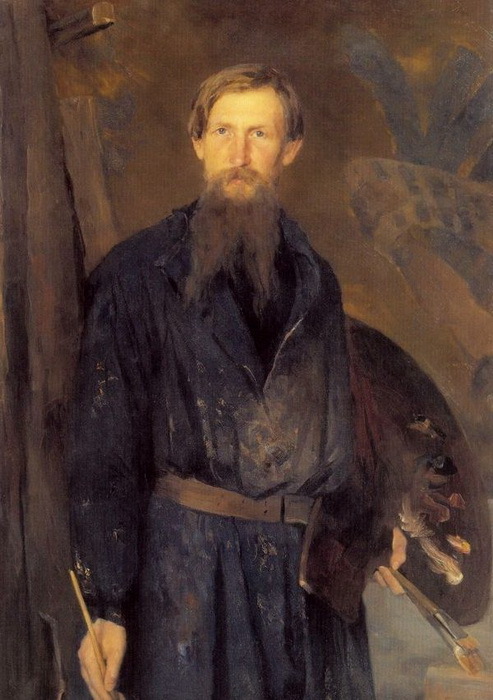 But Viktor Vasnetsov as a phenomenon in the art world could not have held if not for the atmosphere of creativity, conscientious service to the arts familiar to everyone of the brothers from early childhood, and led several of them to the wonderful hobby of creating wood carved furniture. the head of the family, Mikhail Vasilievich Vasnetsov, was a priest in Vyatka province, and from childhood was fond of drawing. 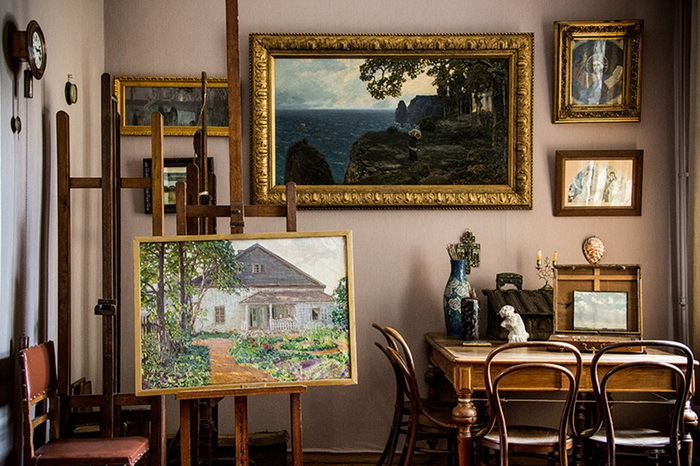 In the house of his mother, grandmother, Viktor Vasnetsov Olga Alexandrovna, as later recalled the artist, all the walls were occupied by pictures, the author of which was herself. The Vasnetsovs family in General was always close to work, its representatives participated in the decoration of temples, the design of the Church fence and decoration of the iconostasis. the Love of art manifested itself in varying degrees, all of the brothers – Nicholas, Victor, Peter, Apollinaris, Arcadia and of Alexander. Primary education to all six gave himself Mikhail. Becoming older, Viktor Vasnetsov began to take drawing lessons close to home, and then went to St-Петербург to get an education in Academy of arts. 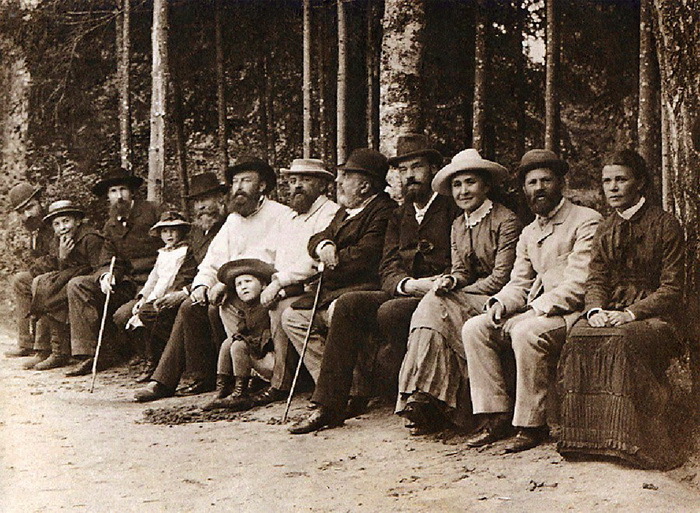 There he became acquainted with many eminent artists, including Kramskoy, Repin, Nesterov, entered the famous Mamontov circle – a creative community built around patron of arts Savva Mamontov and his estate in Abramtsevo. Apollinary Mikhailovich, the youngest brother, Victor, took childhood lessons from Polish artist Michal Elvira Andriolli, working in the field of romanticism, but an academic education never received, despite his studies in Saint-Петербурге such artists as I. Repin and B. Polenov. In the history of national art Apollinary Vasnetsov went through the images of old Moscow is not just artistic, but also created with an impeccable historical accuracy. Another major work of his life was the creation of scenery for theatre productions – including the operas" Жизнь for the king"," Хованщина"," Снегурочка"," Садко". To Abramtsevo mug Apollinarius had the most direct relationship, constantly maintaining communication with its representatives. 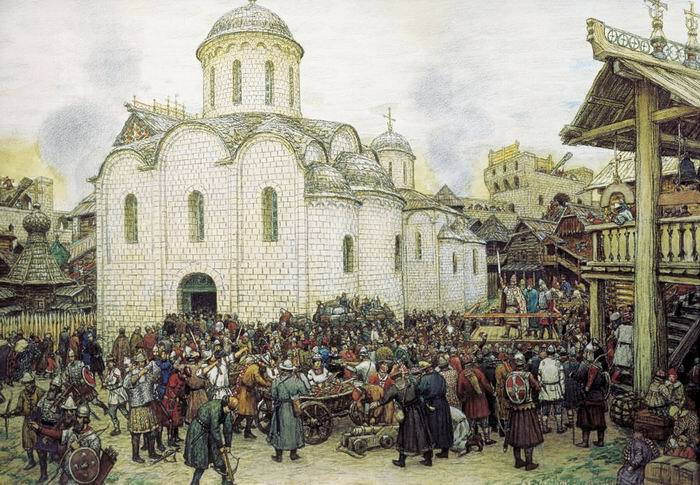 Special event in the life of Abramtsevo was the creation of a carpentry workshop. IN the late nineteenth century interest in folk culture has increased significantly, and held in 1882, the Russian art-промышленная the exhibition has inspired many artists to turn to subjects of applied art. 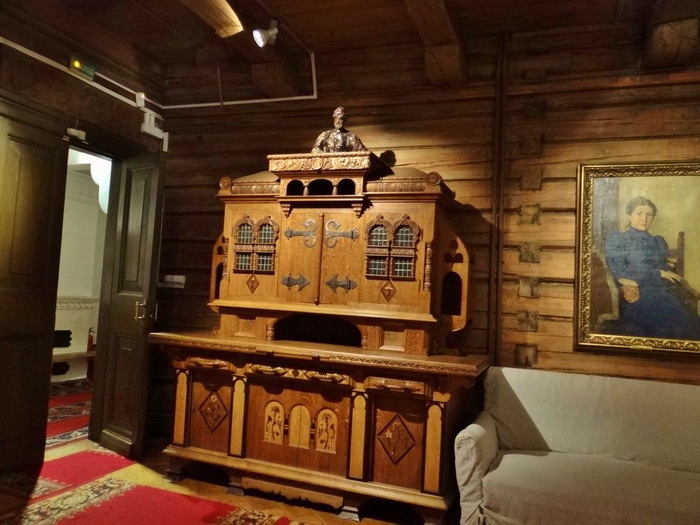 Another well-known philanthropist, Sergey Timofeyevich Morozov, Morozov dynasty of merchants, acquired the property on display at the exhibits and a few years later opened a Museum of Handicrafts, which among other things was exhibited objects created furniture Affairs masters. 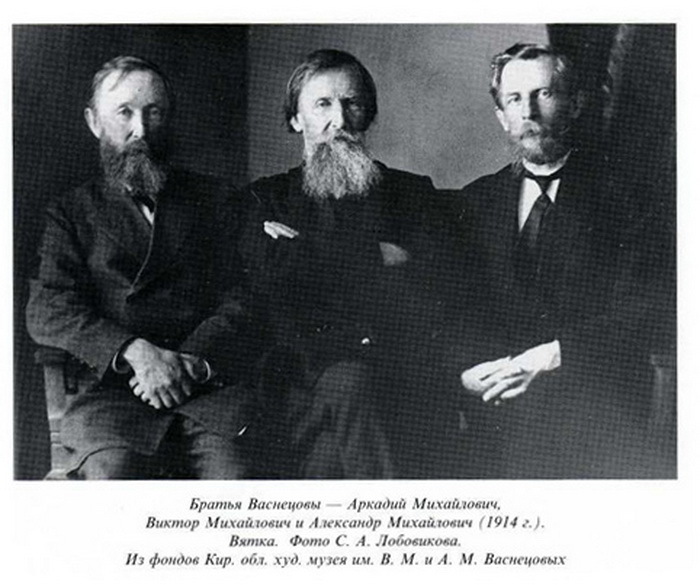 members of the Abramtsevo circle, first and foremost, sister of Vasily Polenov, Elena, Victor and Apollinary Vasnetsovy, Elizaveta G. Mamontova, took the most active part in the search for specimens of folk art and creating your own designs for chairs, shelves, cupboards, chests of drawers and other wooden pieces of furniture, which not only came on display to Museum visitors, but also served primarily to convenience and decoration in the homes of the artists themselves. 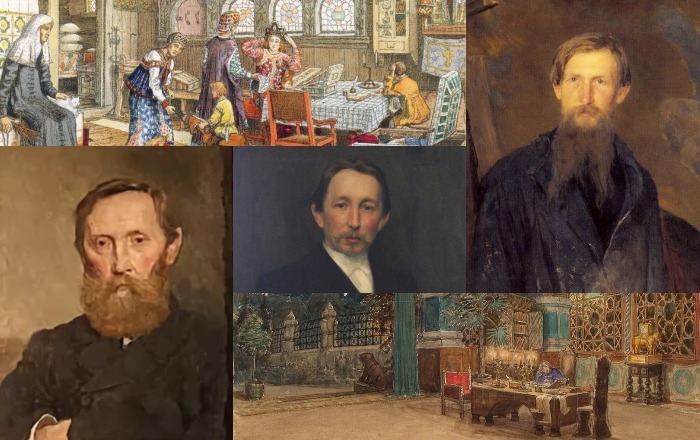 In ten years of operation in Abramtsevo a carpentry workshop in it was created more than a hundred articles including those authored by the brothers Vasnetsov. Here Apollinaris created projects for the interior of your apartment. 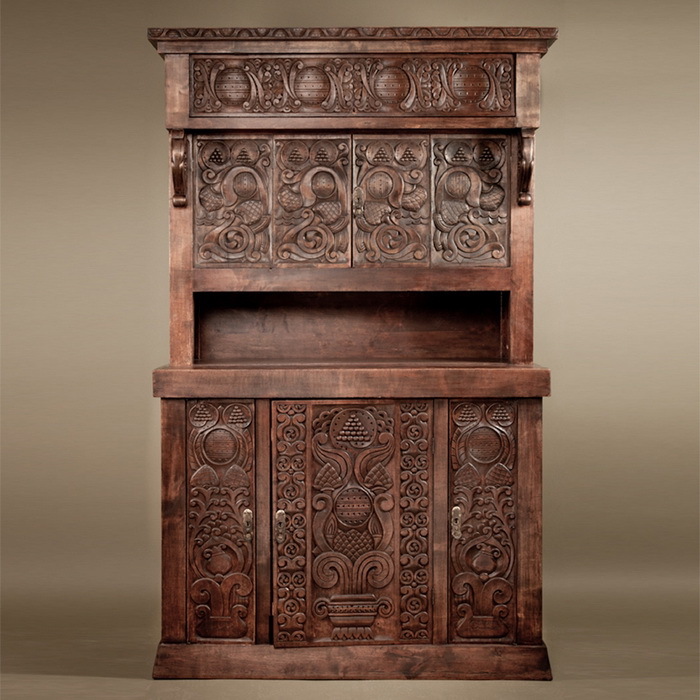 Oak sideboard, with the pediment decorated with carved apples, bolts" под old", reminiscent of Russian chamber. And another, too, of the authorship of Apollinaris returns in the distant past – his door is designed as mica Windows, and the threads contain images of males, grapes, figurines of magical birds Alkonost and Sirin. 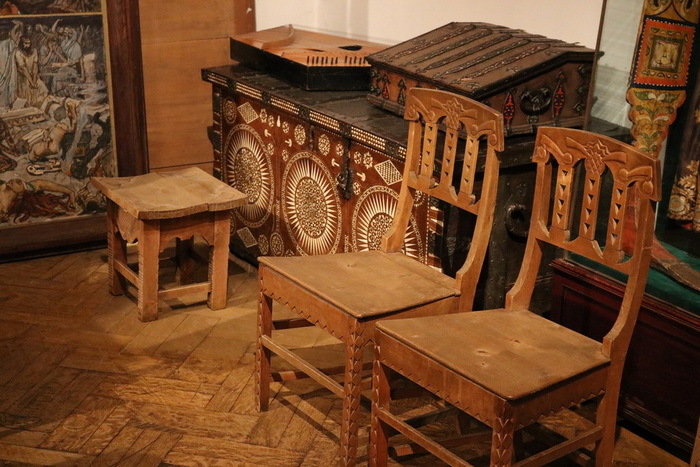 These pieces of furniture now adorn the apartment of the artist – it is a Museum, which contains his works and the interior, which Apollinaris not only created himself, but was found on the famous Sukharev market nearby. One of those acquisitions was the chest-подголовник – chest, which took to the road and put it under his head at night. 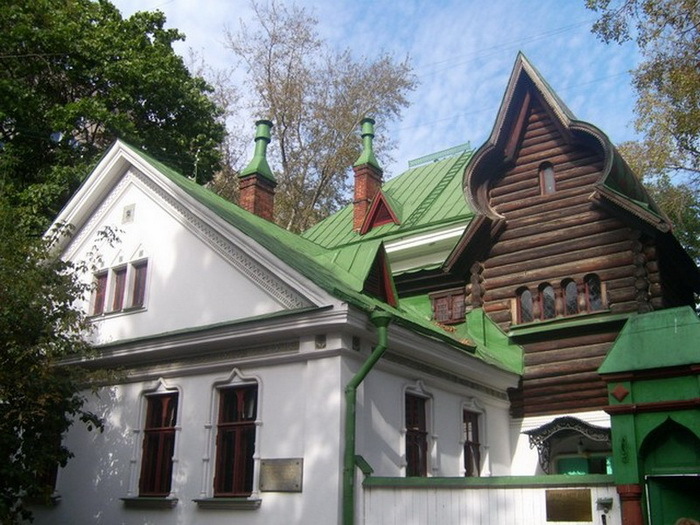 the works of the masters of Abramtsevo and the workshop of the crafts Museum in Sergiev Posad, where products frequently used artists " sketches – the epitome of neo-Russian style in the decorative-прикладном art, and may complete his expression became home improvement by Viktor Vasnetsov decorated in a fabulous Russian Teremok. 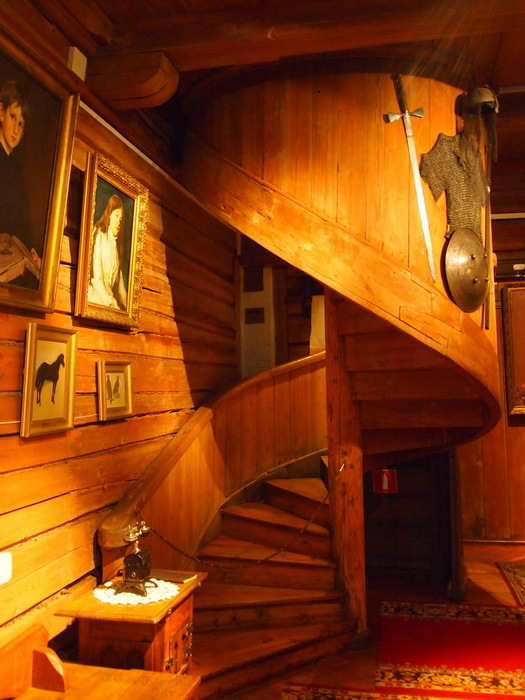 the interior of your home artist are treated with special attention – it is sufficient to mention the huge light-filled Studio on the second floor, where led spiral wooden staircase and on the wall hung a suit of armor – to depict in the paintings of heroes. 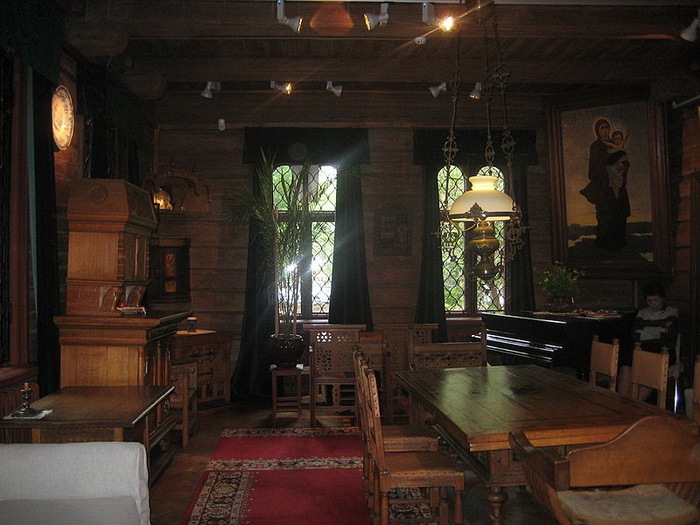 The whole atmosphere in the house of Vasnetsov was invented or created by him. 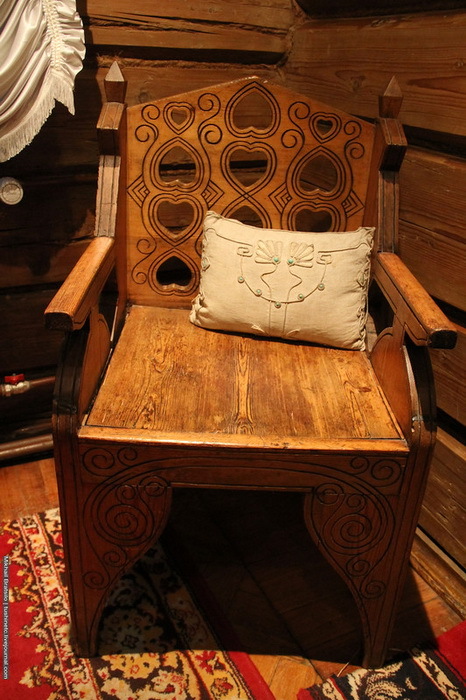 Chairs on sketches by Viktor made his younger brother Arkady, a magnificent Woodcarver by profession, a people"s teacher. In the Abramtsevo workshops was made, and a large oak table and chairs at the table, and footstool, and a small buffet" s owls". 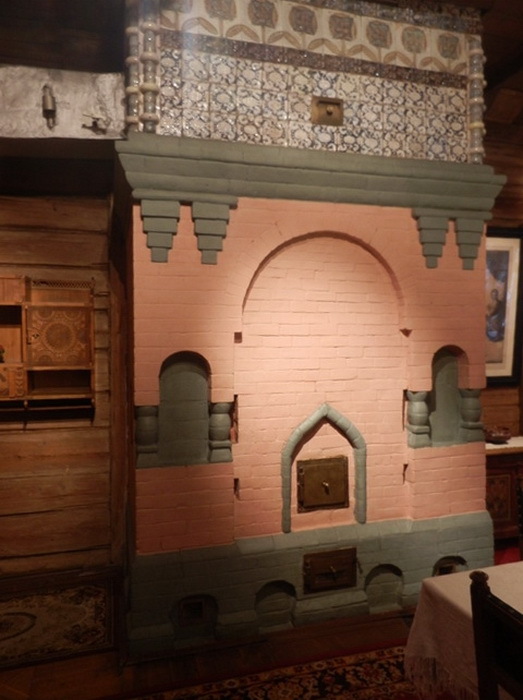 In the dining room also housed the cafeteria, Arkady made under the project of Viktor buffet, named" самобранка". It seemed that the food there themselves – the fact is, in the back of the pantry facing the kitchen, was made door, and the cotton of the owner of the house – like a fairy tale – the cook put the dishes inside. Fabulous in the house of Vasnetsov became furnace – also in the form of the house, the tiles for which were produced in Abramtsevo by artist. the atmosphere of the house of Vasnetsov, which can hardly be called a Museum – so preserved, alive, living environment, and at the same time permeated with the spirit of antiquity and the individuality of the artists working for the house or visited his. 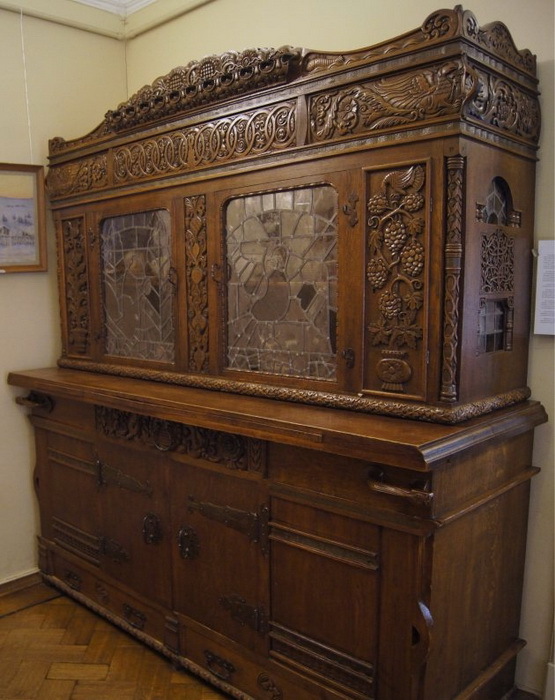 same with the apartment Apollinaria – style furniture vintage Moscow does not look deliberate or old-fashioned and fascinated in the world of fairy tales and art, in which the brothers Vasnetsovy were not just talented artists, but also great workers.